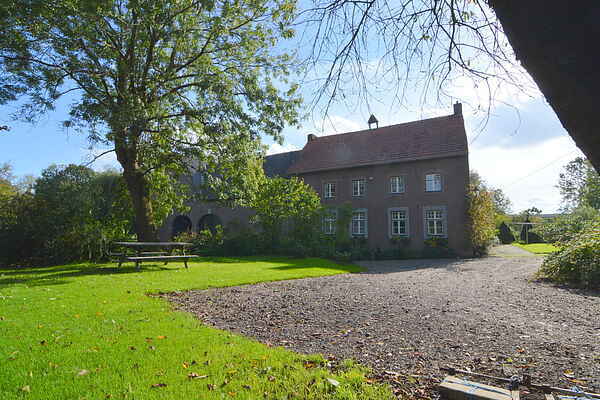 This historic courtyard estate “Carré Hoeve” is nestled in an idyllic setting in the South Limburg hills. In the middle of the estate is a wonderful enclosed garden with a pond and a place to sit. Surrounding the house are pastures with sheep and horses. This traditional farmhouse is very old and abounds in character and charm. The friendly older lady who lives here with her sheep, horses, dog and several cats has created two comfortable holiday apartments in the house. The Swifter apartment, named for the breed of sheep, is located on the first floor. In addition to a wonderful spacious open-plan kitchen you also have 3 bedrooms, one with an en suite bathroom, a generously sized living room and a second bathroom. If you enjoy hiking and cycling and natural beauty, then you are sure to fall in love with this place. You will be staying in a fantastic recreational area for hikers, cyclists and horseback riders. There are plenty of options for daytrips as well. Valkenburg is always a fun place to visit, just 6.5 km away, while Maastricht and Aachen are under 20 km. There is also the option to bring your own horse(s), since there are stables available as well as pastureland and a carriage shed. Details can be discussed with the owner.